Work less and save the planet! 1.The working hour paradox. A general trend is that we become more efficient in producing goods and services. This is the major factor behind economic growth in the last hundred years. In the past, this was partly used to reduce working hours. J M Keynes had a vision that his grandchildren would be able to satisfy their needs with just a few hours of work per day. Karl Marx had similar vision of a society of more leisure after our needs had been satisfied. But Bertrand Russell mocks about our inability to benefit from the progress in this way (see ”In praise of Idleness” 1932). After we reached the 8 hour day in the West this development has halted. Instead we have increased consumption – and economic growth – beyond the means of the planet, creating the present ecologically unsustainable situation. The notion of economic growth is so strong that to suggest shorter working hours is considered a ”third rail issue” by most politicians – such suggestions may cause a political death just like it is deadly dangerous to touch the third rail in the subway! (I have written several reports on working hours including my doctoral dissertation about the history of the working hours issue over 100 year – see a summary here! ead to goods and services with a reduced environmental impact: energy-efficient cars, better insulated houses etc. But by and large, we have used this to increase the volumes of consumption rather that profiting from the possible saving – the so called ”Jevons paradox” (from 1865). Environmental policy becomes like chasing your own tail. The non-shrinking work day is an extended example of this paradox. 4.The locked-in consumer. In principle, the consumer is the king who rules over society’s consumption. In practice consumers are more or less forced to a consumption pattern dictated outside his/her control. This applies to the availability of goods and services, to technical systems and the urban structure etc. Indirectly, the consumer is also limited by social and cultural norms and influenced by media and marketing activities. Sustainable consumption would require political action in all these fields. This book (from 2007) covers all these issues and relate them to sustainable development; it is called “Keynes’ grandchildren” with reference to his vision (even if environmental issues were not on his mind in the 1930s) about of a society which has solved "the production problem" allowing us to enjoy our leisure rather than spoiling the earth by overproducing.. I have been working with future studies in many fields: traffic and town planning, care and health systems and work and the use of time. I am now retired from a post as teacher/researcher at KTH (Royal Institute of Technology in Stockholm) but keep up some work. 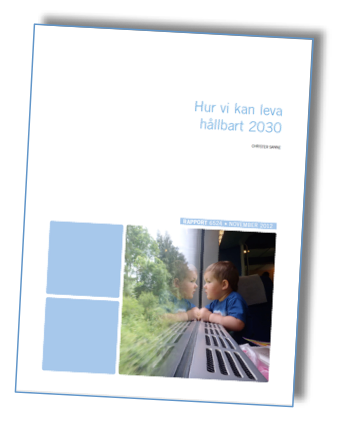 In 2007 I published "Keynes' grandchildren" (in Swedish) – see below left. The first chapter is available for reading in English. For my latest book 2012 on how to live sustainably – see box. I have lectured countrywide on various aspects of sustainable development and I continue to write for Swedish dailies and journals. I was engaged in the first conference on ”degrowth” 2008 and have been to two more (see box). I also took part in the conference ”Wachtstum im Wandel” (Growth in transition) in Wien/Vienna 2010. The same year, I chaired a session at the Steady State Economy Conference in Leeds, UK. My introductory text is here. 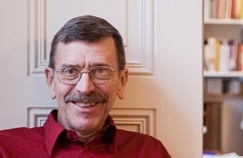 I have also lectured in Riga, Latvia and Denmark in 2013. Here is a selection of my previous publications and academic texts. My latest book is a ”blueprint” for a sustainable future for a rich country like Sweden. I strive to express it in figures to illustrate a combination of technical change and lifestyle changes that will be needed to reduce the carbon footprint with 70% in the coming twenty years. A very rough description is that we might be able to live on a 1990 material standard (but with the technology of 2030) and work 10 hours less per week (in order to curtail the growth in production/consumption). In April 2008, I participated in the first international conference on degrowth in Paris. My two presentations – on degrowth as a "third rail issue" and on sharing work – are available as edited Powerpoint-pictures, see under the conference program (not in the printed proceedings). In March 2010 I participated in the second conference in Barcelona. My presentation is available here (text). Pictures will be published on the conference homepage. “Degrowth by leisure – step down the upwards escalator!” which is available here. In the 70-ties I worked as a nutrition planner in Tanzania. In 2009 I returned to Africa, to Mali. Sadly realizing that too little development had taken place, compared to the swift changes in the rich West. 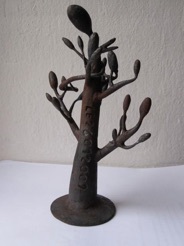 This small iron sculpture is however proof that cultural richness is still possible in a materially poor country!